Since 1992, Tri-City Crating and Packing has provided San Diego County clients with high quality custom boxes designed and fabricated by skilled professionals. 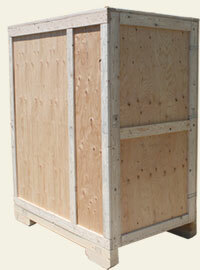 We specialize in the safe and secure packaging of items of all types and sizes. Our high quality boxes can be custom made for a variety of applications. From protecting fragile antiques, artwork and personal items to functioning as long lasting tradeshow crates and exhibitor boxes, our custom boxes are professionally designed and fabricated to satisfy any of your crating needs. For added protection we can install support bracing made from wood, metal or foam, further guarding your cargo from potential damage. We also offer vacuum packing and environmental barriers that will effectively shield your cargo against moisture and humidity damage. Whether you already know your crating specifications or need some help with the design and fabrication process, our staff of experienced specialists will provide you with free estimates, knowledgeable recommendations and on-site measurements and assessments. We will deliver your custom box at your convenience and pack your cargo on-site. Shipping arrangements can be made on a case-by-case basis. Call today, and our friendly, knowledgeable staff of professionals will assist you with all your custom crating needs.